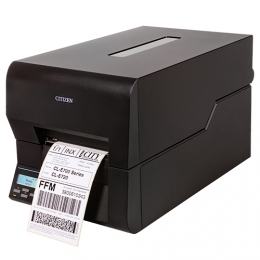 The label printers of the CL-E700 Series from Citizen are the link between the desktop printing class and high performance industrial printers. The models are specially conceptualized for the flexible production of product and shipping labels in a large variety of environments, such as warehouses, logistics and production. But retailers benefit as well thanks to their compact size 250 x 458 x 261 mm and excellent price-performance ratio the CL-E700 Series is also ideally suited for usage in both retail and wholesale. Because of its top value for the money the CL-E700 Series is ideally suited for users with an approximate print volume of 3,000 labels per day. With the CL-E700 Series you benefit from a large selection of interfaces the printer features standard integrated USB and network ports 10/100. An additional interface slot grants space for optional interfaces, such as RS232, parallel or WLAN. Thus, the printers offer various options for usage and the user controls them via remote management. Also, you may adjust the settings with the Citizen LinkServer configuration tool, which allows the printers to connect via a web browser. Thanks to its metal housing and proven Citizen printing machine, all models of the CL-E700 Series are particularly robust and reliable. Produce high-resolution labels with up to 203 mm per second 150 mm/sec. at 300 dpi and exceptionally high quality - and at low print costs. The front-facing integrated LCD display, color ribbon display and adjustable media sensors make the printers very user-friendly. Citizens Hi-Open and Hi-Lift mechanisms ensure for minimal space requirements when changing consumables the footprint always remains the same, whether the cover is open or closed. The EasyLift media holder ensures that users are able to quickly, simply and comfortably change media rolls. The entire CL-E700 Series comprises three robust label printers CL-E720DT, CL-E720 and CL-E730. The CL-E720DT is ideal for users who solely wish to use direct thermal printing. For quick high-quality label printing the CL-E720 is the right choice. If it comes to print jobs requiring highly detailed results, then rely on the CL-E730, since it prints at 300 dpi in either direct thermal or thermal transfer mode. No matter which model youchoose, each of these printers is equipped with high-quality components, and impresses with reliable, long-term performance and a low total cost of operation. Therefore, the Series closes the gap between desktop label printers for daily use and long-wearing industrial printers. Thanks to their energy saving power supply the printers feature the Energy Star rating, and are among the most environmentally-friendly devices in their class. An LCD standby timer and the particularly low energy costs in standby mode ensure that energy use is lowered, also saving costs. With the CL-E700 Series Citizen offers optimally and individually equipped printers, which are always the right choice for your applications.